Teams and individuals qualify for the IHSA National Championship Horse Show in Syracuse, New York. Fairfield, Conn. ­­– March 20, 2019 – The Intercollegiate Horse Shows Association (IHSA) held its Western Semi-Finals, sponsored by the National Reining Horse Association (NRHA), March 16-17. Hosting the events were Florida State University (FSU) at the Florida Horse Park in Ocala, Florida, Utah State University (USU) at their facility at the USU Equine Center in Wellsville, Utah, and University of Findlay, at their facility in Findlay, Ohio. 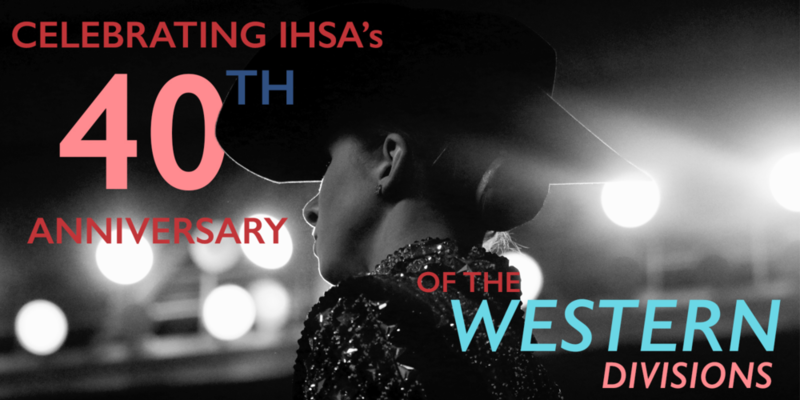 IHSA is celebrating its 40th anniversary of the Western divisions this year. At Semi-Finals hosted at Florida State University the team from the Ohio State University, coached by Ollie and Debbie Griffith, clinched the overall team win with 36 points edging out Berry College with 22. Cal Poly State University, San Luis Obispo, took the third spot earning 16 points. In 2014, the Ohio State team won the national championship. All top-three teams are National Championship-bound. Griffith said that Erin Bosse, a senior this year, has come really far in the program and contributed to team win by earning the blue ribbon in both the Team Open Horsemanship and Team Reining. Bosse also clinched the win in Individual Open Horsemanship. Second-place finisher Sarah Cooper, from Berry College, will join her to compete at Nationals along with Travis Fortune, from Murray State University, and Matthew Winter, from the University of Florida, who were third and fourth respectively. In Individual Reining, the judges’ top pick was Ethan Stratford, from the University of Guelph. The second and third place prizes went to Mary Catherine Wade and Jenna Seal, both from Middle Tennessee State. Fourth-place Bosse will compete at IHSA Nationals in both Individual Reining and Open Horsemanship. Lynn Palm, from Ocala, Florida, and Allen Mitchels, from Michigan City, Indiana, officiated at the FSU-hosted event. Utah State University hosted their first-ever Semi-Finals at their Equine Center and live-streamed the event for fans and families across the country. IHSA founder and Executive Director Bob Cacchione participated in impressive opening ceremonies and was on hand to present prizes and greet coaches and riders. Judges Dawn Kreakie from Seville, Ohio, and Lori Gordon of Washington, Pennsylvania, presided over the event. The overall Team championship went to the Oregon State University with the reserve championship to University of Wisconsin, River Falls. State University of New York at Morrisville finished third and punched their ticket to Syracuse. Nordby started as an Open rider and has competed on the team all four years and qualified for Nationals every year. After graduation, she plans to take a year then go on to get her master’s in clinical psychology. She credits her Oregon State coach Dawn Ross for her support through her years on the team. In the Individual Open Horsemanship at Utah State Semi-Finals, it was déjà vu for Rocky Mountain College’s Codi Uecker who won the for the second consecutive year. She will be joined by second-place finisher Danielle Paulson, from the University of Wisconsin, River Falls, at Nationals. Third-place finisher Sarah Beth Felker, from St. Andrews University, and fourth, Christina Mulford, from Northern Kentucky University, will also make the trip to Syracuse. Jacob Kamm, from the University of Cincinnati, grabbed the win in Individual Reining with Aubrey Braham, from Slippery Rock University, in second, repeating her results from last year. Caitlyn Davis, from Utah State University, and Kindra Gingerich, from Saint Mary of the Woods College, were third and fourth. The 2018 IHSA Western National Champion Findlay Oilers hosted a third Semi-Final event. Carolyn Johnson Russell, from Ringgold, Georgia, and Pete McAllister, from Mitchell, Indiana, judged the event. The Findlay team finished in the lead on their home turf, winning five classes and earning 39 points. Northeastern Oklahoma A&M College and the University of Nebraska, Lincoln finished in the second and third positions with 23 and 20 points, respectively in the overall Team competition and will progress to the IHSA National Championships in Syracuse. Zimmerman is only in his second year in the position at Findlay and he will lead his team to Syracuse to defend their 2018 championship title. In the Individual Open Horsemanship division, Matthew Graves, from the University of Nebraska, Lincoln, owned the day. Arianne Cox, of Texas Tech University, took second place, Kendall Woellmer, from West Texas A&M University, was third and Carla Carfora, from Northeastern Oklahoma A&M College, was fourth. Carfora brought her game to the hotly-contested Individual Reining division, finishing in front. Woellmer scored second. Julia Roshelli, from the University of Findlay, and Cailyn Simonis, of North Central Texas College, had the third and fourth slots to qualify for IHSA National Championship Horse Show in Syracuse. The Intercollegiate Horse Shows Association (IHSA) welcomes men and women of all riding levels and offers individual and team competition in hunter seat equitation, Western horsemanship and reining at more than 400 member colleges and universities. Membership in IHSA means that college students can participate at horse shows regardless of their experience or financial status. Students compete at eight levels from beginner through advanced with suitable, provided horses, eliminating the expense of horse ownership. Founded in 1967 by Bob Cacchione, it is the oldest and largest intercollegiate equestrian organization with 10,000 members in 47 states and Canada. IHSA college and university team participation is represented through a variety of programs including varsity athletics, academic departments and club sports. IHSA offers valuable hands-on experience and professional development in multiple facets of the equine industry. Many IHSA teams participate in service projects, giving back to their communities. Through the IHSA, students enhance their college experience and develop the tools that help to build successful careers.